OceanCanada Research Director Rashid Sumaila and his collaborators from the UBC Global Fisheries Cluster(Sea Around Us and the Nereus Program) have published an updated estimate of global fisheries subsidiesin the international journal Marine Policy. The researchers found that the global fishing industry is being supported by $35 billion yearly in government subsidies, the majority of these, upwards of $20 billion annually, promote increased capacity that can lead to harmful impacts such as overfishing. The differences between countries were analyzed, with developed countries contributing 65 percent of the total. The top three subsidizing countries were found to be Japan, China and the United States. The EU as a block also looms large. 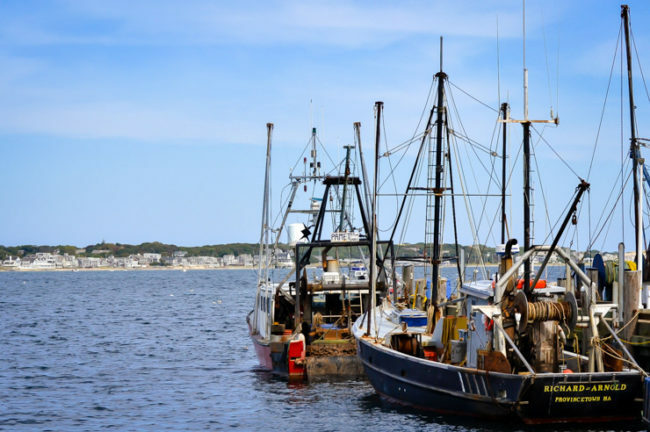 Here co-author and Nereus Research Associate, Wilf Swartz, discusses what fisheries subsidies are, the difference between the types, and the implications of these results. Any use of government funds to specifically help the fishing industry. This could be anything from a cash payment, to tax breaks to free services, like building a port or infrastructure. What kinds of subsidies are there? 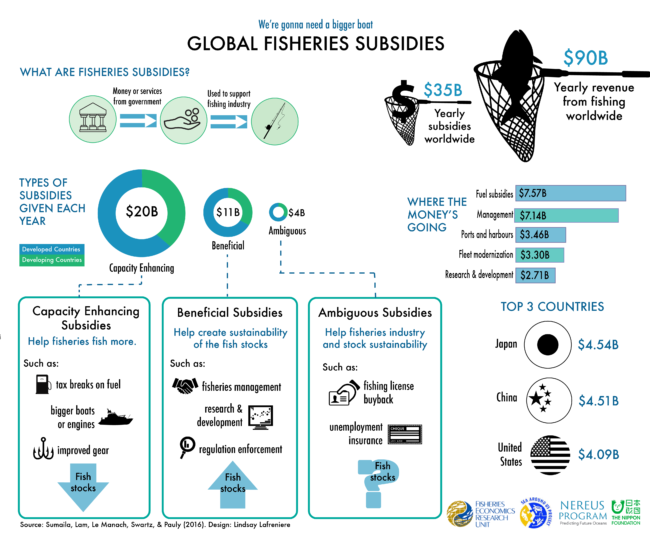 We categorize subsidy programs into three types based on their expected impacts on fishing capacity and overfishing – capacity enhancing, beneficial and ambiguous. Capacity enhancing subsidies allow fisheries to fish cheaper. These could include building ports, tax breaks on fuel, assistance with building bigger boats or engines, or updating gear. For example, if a fisher is building a boat, the government may agree to cover 20% of the construction costs. Beneficial subsidies are for ensuring sustainability of the stock. This could be resource management, fisheries management, science and research, or regulation enforcement. Ambiguous subsidies are a mixture of the two. They could have both the effects intended with capacity enhancing and beneficial subsidies depending on how they are implemented– helping fisheries and ensuring sustainability. An example would be buying back old fishing licenses. This gives more money back to the fishers and reduces the number of fishing boats out there, but the vessels out fishing might have bigger engines or nets. Another example would be unemployment insurance for fishers. There may not be enough jobs since the stock is not strong enough, so it helps by giving them money but perhaps they should be working in another industry anyway. What were the main findings of this study? We accumulated as much information as possible, from government reports and statistics, and estimated the global levels of fisheries subsidies. We found that $35 billion in subsidies are put into fishery industries around the world every year. Given that the total global revenue from fishing is $90 billion per year, landed and sold, a third of revenue is from handouts effectively. We found that capacity enhancing subsidies are the main subsidy given and most is from tax breaks on fuel, almost half. The issue is that if fishers were paying regular prices on fuel, they probably wouldn’t be going out five days a week or going out as far, so the fishing efforts would be less. Subsidies may support the fishing industries but don't always support the sustainability of fish stocks. Image: "The Richard Arnold" by Marcy Leigh, (CC BY-NC-ND 2.0). What are the negative impacts of subsidizing the fishing industry? Capacity enhancing subsidies support the industry, but, potentially, they allow fishers to continue to fish when there may not be fish available. They do not ensure sustainability of the stock nor the industry they are intended to support. They allow fisheries to continue to invest in themselves while the stocks are being diminished by overexploitation. Other industries, such as agriculture, are also heavily subsidized but fisheries are a unique case because the productivity of the industry is constrained by the natural productivity of the stock that we exploit. The more money you pour in doesn’t necessarily result in more production. How are subsides different for developed and developing countries? 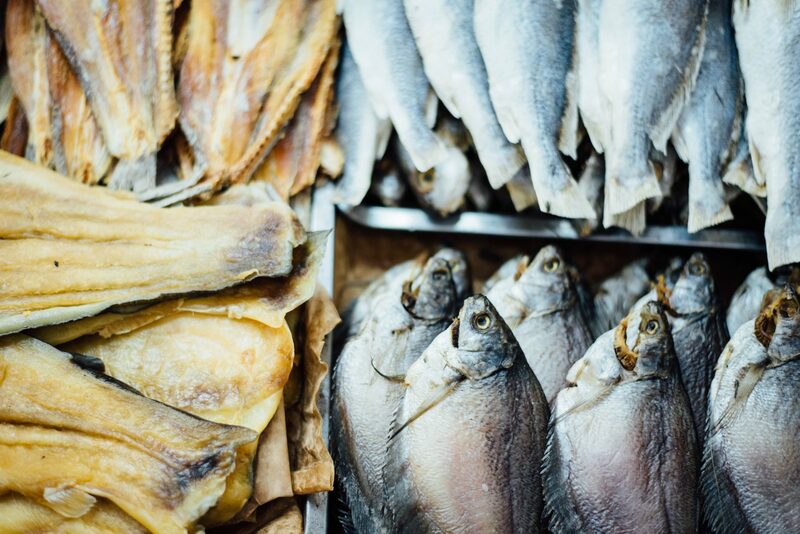 Fisheries subsidizes distort the international market for seafood. There are also production distorting effects, since some countries are at a disadvantage if they can’t provide the same level of subsidies. With say, tuna fishing, those countries that are heavily subsidized can fish more tuna, whereas other countries that are fishing the same stock are competing. Developing countries have smaller economies, so they can’t subsidize the fisheries as much. The subsidies are implemented at a national level, but globally there are no rules in place. Smaller countries can never out subsidize the larger economies like China or Japan, so they should instead be pushing for no subsidies, as this would create an equal playing field.